Not everything is quiet on Obama’s front. Economic crisis, unemployment, the crisis on Wall Street, executive compensation, General Motors, the environment just to name a few issues he has to tackle and he is only in his mid fifties. Oh, not to speak of a record current account deficit that is now poised to break through the alarming 1 trillion dollar mark. On foreign policy two wars, in Irak and Afghanistan, are still looming high and no end seems in sight. The solutions promised to the people in the Middle East are a reason for deep frustration. Israel-Palestinian peace negotiations seemed to have stalled in part because of lack of leadership from the US. And above all the nuclear stand-off with Iran. President Obama has more than once stated during his campaign speeches that he is frustrated with the lack of progress in the Israel-Palestinian conflict. He sees it as a "constant sore" that "infect[s] all of our foreign policy". Vice-president Jo Biden and General James Jones, Obama’s national security adviser, wowed to be ‘more forceful toward Israel than under Bush’. This has alarmed a powerful pro-Israel lobby group in the US to get Congress to deliver a written letter to president Obama in an attempt to right what seemed wrong for Israeli hardliners. The American Israel Public Affairs Committee (Aipac) calls on the US to remain a devoted friend of Israel. Aipac wants to maintain the current pace of negotiations with the Palestinians and does not see this conflict crucial to peace in the Middle East. By the way Aipac also wants military attacks on Iran’s nuclear facilities something the Obama administration clearly rejected so far. Aipac is very powerful and has considerable influence over American lawmakers. Their message is clear, that there will only be a two-state solution when Israel is ready for it. Well, they had about 60 years now, that is a lot of prep time. So, hopefully Obama stays the course so as to this region will have peace in our lifetime. There are considerable forces that work against a two-state solution. Netanyahu’s speech about the conditions for a formation of a Palestinian state was meant to be rejected and certainly will not in anyway open a door for successful peace negotiations. The Obama administration is under considerable stress concerning the nominations of some of their top administrative positions. In March Chas Freeman, a veteran American diplomat and former ambassador to Saudi Arabia, had to withdraw as chairman of the national intelligence council. Behind this move is arguable Freeman’s criticism of Israel. The "Israel Lobby", he argued, was stifling any discussion of US policy options in the Middle East except those endorsed by "the ruling faction in Israeli politics" – a situation that could "ultimately threaten the existence of the state of Israel". This underscores the alarmingly powerful influence Aipac has in Washington and although the last elections brought hope of change, so far its the same ol same ol. Wait, maybe not so fast. Obama has obviously sacked a state department advisor on Iran. Dennis Ross, Hillary Clinton’s special adviser on Iran has been removed from his post because of reports that Tehran was unwilling to engage with him. Ross is believed to be very close with Israel. The real reason for his removal is his rejection of the Obama administration’s approach to the Middle East. Mr. Ross sees himself eye to eye with Aipac and Netanyahu. Well his boss did not like it and fired him. I hope we will see more of this, because it is absolutely clear by now that peace in the Middle east will only come if Israel will be forced to accept it. While the most recent events in Iran get extensive coverage the world over, another significant development on the political stage is being ignored. Western media beat themselves to the bunch in broadcasting every fart coming out of Iran, and yet they did not report a visit of the Gaza Strip by a former president of the United States. Jimmy Carte is regarded by many in the US as the president wearing a cardigan reminding them to save and not to spend money they don’t have. Seems pretty smart and farsighted now, doesn’t it. 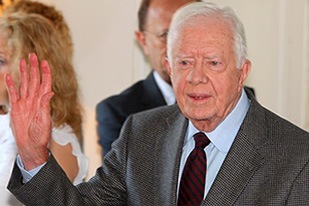 So when Jimmy Carter visits the poor people of Gaza the world should listen and observe when he has to ‘hold back tears’. The former US president was due to tour areas destroyed by Israel’s 22-day war against the Hamas-ruled territory earlier this year. The offensive killed more than 1,400 Palestinians, many of them women and children, and left large areas of the impoverished strip in ruins. Thirteen Israelis died during the conflict. Carter told students at a graduation ceremony in the Strip: "I have to hold back tears when I see the deliberate destruction that has been raged against your people." One person that did certainly not listen and who’s heart seemed out of stone is Binyamin Netanyahu, the Israeli prime minister. In a recent speech he outlined his vision for Israel and peace. Unfortunately while he praises the right of Israel to live in their ‘historic homeland’ he completely fails to recognise the same right for the Palestinian people. Demilitarization of Palestinians, Israel’s right to expand existing settlements and the demand for resettling Palestinian refuges outside of Israel are all but unacceptable for the poor people of Gaza and the West Bank. And the simple truth is that the root of the conflict was, and remains, the refusal to recognise the right of the Jewish people to a state of their own, in their historic homeland. Netanyahu justifies all this and destroys the glimmer of hope for the Palestinian people with one sentence. He is not ready to grant his neighbors the same right he demands for Israel, to build a free, independent and true neighbor state. Under these conditions Palestinians had to reject Israel’s terms. It is up to true leaders like Jimmy Carter to recognize injustice and to bring it into the public view. Though this fight seems to resemble Cervantes Don Quixote ‘tilting the windmills’ it is a true fight and it is as important as peace itself in the Middle East.